THE MDNA WORLD TOUR 2012 – Setlist Spoilers Part 3 – EXCLUSIVE!!! We at Madonnarama already revealed the first part of the setlist for the MDNA World Tour and now have got more new exciting information from our very reliable sources! Again, keep in mind that Madonna is currently in rehearsals and that the final setlist might include some changes. We already reported that Madonna will be collaborating with Basque trio Kalakan for a revisited version of Open Your Heart together with Sagarra Jo, but that’s not all! We can now reveal that Kalakan will be featured throughout the whole show mostly singing parts of some songs, doing backing vocals or playing instruments. As we previously stated, the MDNA show opens with the Religious Chants intro/backdrop, sung by Kalakan. They are then joined by Madonna for her Act of Contrition right before the Girl Gone Wild number. Also, a new track that has been added to the setlist is Masterpiece and the trio will be adding some vocals giving the song a very unique feel. Unlike the album version, it features more violins and we heard Masterpiece could replace Falling Free in the final setlist. This isn’t just a coincidence! Madonna will be performing I’m a Sinner and Cyber-Raga mashed up together in one song featuring the Kalakan trio, who are giving it a whole new dimension! 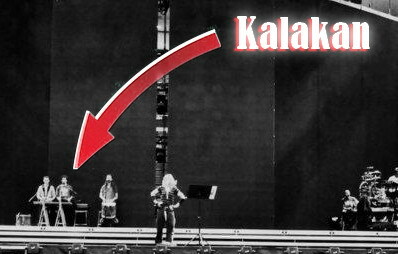 Another song that will feature Kalakan is none other than Like a Prayer! The trio will be singing the choir part of the song. Last but not least, Kalakan is also joining Madonna on Celebration, that is currently being considered as the closing number for the show.